Glass lamp shades are great decorations for the house. They come in a variety of colors and designs that will aid in the overall look of the house. Since they are made up of glass, the light will reflect from them and create a luminescent appearance. They can be placed either indoors or outdoors depending on what kind of lamp you have. 1. Stained glass lampshades- this type of lampshade is normally seen outdoors. They are usually available in an art deco or antique design. Since the glass is stained, the lighting that it provides is soft rather than glaring. The most popular stained glass lampshades are found on Tiffany Lamps. 2. Chandelier lights- commonly seen in big houses, the chandeliers are usually made of glass to give off lighting reflections. Some chandeliers even have hanging glass reflectors so that the lights will have a wider area of reflection. Chandeliers are mostly classified as hanging lamps. 3. Torchiere lamp shades- the torchiere lamp shades are the floor length ones that can be seen in bedrooms and in the living room of large houses. The most common designs for this type of lampshade are the glass dishes that reflect the light upward so that it can illuminate to the ceiling. The color of the lights that are usually used are yellow or white. 4. Cased glass lampshades- the light bulb in this type of lamp is totally encased in glass. That means that instead of reflecting to a certain area, the light glows and give of lighting to its surroundings. Normally you will see two shades of colors: the light inside mixed with the color of the glass gives a different color, while the emitted light from the whole lamp gives off another color. The cased glass lamp shades are normally seen in side tables of the living room or the bedroom. Some people also place these types on their office desks. These types of glass lamps are usually used for decoration. But aside from that, they can also provide the user with the amount of lighting that he or she needs. They can also help a lot in creating the right ambience for a particular room. Everyone has lamps in their houses and each one has a light shade. While most lamps have a beauty aspect, if they are dusty and dirty it detracts quite a lot. The consistent build up of dust on lampshades can even cause permanent damage and will devalue the lamp. It doesn't have to be that way. You can take some easy measures to maintain your light shades, lamps, and lamp fitters. This way your lampshades will last a long time for you. Of course, looks is not the only reason to clean them. If layer upon layer of dust is allowed to accumulate, the amount of light coming from your lamps will be greatly reduced. This will cause rooms to seem darker and can actually cost you more money in the long run, because more lamps need to be on to produce the same amount of light. 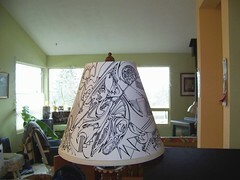 Lampshades are made of many different types of materials and each may need to be cleaned in a different way. The most common shade is made from a fabric stretched over a frame and a fitter. Fabrics give the best range of colors and patterns to match any home decor. Replacement light shades are often used to match a new carpet or drapery. The first aspect of cleaning a fabric shade is safety. You must unplug the light the remove the shade. Safety should be first for any type lamp shade, sot his step really applies to all types. You can try a new paint brush on the fabric to see how much dust you can get off. With a few strokes, you may be able to clean a fabric shade quite well. Don't forget to clean the inside as well. If the paint brush doesn't work as well as you want, you can try warm, soapy water. Be sure to rinse well in clear water and let fully dry. If your shade is made from paper, you really can't clean it very well, except to use the paint brush and maybe some very light vacuuming. If dusting it clean this way does not work, consider a replacement light shade for the lamp. Glass light shades are some of the prettiest and some of the easiest to clean. As with all the other types, you can start by dusting them off with the soft brush to determine how dirty the shade really is. Soap and water works great , as needed, for glass shades, just be very careful not to break it. Rinse in warm, clear water and use a soft cloth to dry. Light shades is just another word for lamp shades, and come in many shapes and sizes and add to the decor of a room. Silk and stained glass shades can be very expensive with fabric and plastic much less costly. One of the easiest ways to change and update a room's appearance is to do a replacement of the lighting or just the lamp shades. The first thing to consider is the lamp fitter if you are looking for a replacement lamp shade. The fitter will determine what type and size of shade will work for you. While replacing lamps or shades with plug in swag lamps may be the best option, often times cleaning the existing shades will be the easiest way to make big difference in the lighting. It will always be cheaper to clean than buy replacement shades. Cleaning some types of light shades, such as a hanging swag lamp, can present challenges and are more labor intensive than others. Here are a few helpful hints when you want to try cleaning your light shades and by the way, some people call them lightshades. The first line of defense is to perform routine lamp shade maintenance each time the room is dusted. For hard shades made of glass, plastic or fiberglass, a thorough dusting with a soft cloth on both the inside and outside is sufficient. Follow up with glass cleaner when necessary. If very dirty use a mild detergent to wash them first. Be sure when you do any cleaning that the lamp has been off for a few minutes and has cooled . Hot bulbs could burn you or melt your duster. There are several ways to keep fabric shades dust-free. They can be vacuumed with the soft brush attachment or rolled with a lint roller. Pleated shades can be successfully dusted with a soft paint brush. Some shades, if they are very dirty, can be washed. If you do decide to wash them there is some prep work that must done first. The fitter must not be made of the type of metal that will rust. It can rust as a result of the contact with water and the rust may stain the shade. Remove all washable trim. It the fabric is glued to the frame, sew it in place so it doesn’t fall apart. Fill a bathtub or clean garbage can with water and mild detergent. Put some of the soapy water on a small part of the material to be sure it is colorfast. Submerge the lamp shade and swish it around in the water. When the water is dirty, let it out and fill with clean water. If the shade is still dirty repeat the entire process until it is clean and the rinse water is clear. Hang it up to dry. These instructions do not apply to silk shades. They are very expensive you may wish to have them professionally cleaned. If you want to try to wash them, a great video can be found here describing a way to clean silk shades at home. articles, we found these that may be of interest to you. An Antique Glass lamp shade adds a touch of style to any room. Learn about the different types of lamp shades and how to use them in decorating your house. When it comes to decorating your baby's nursery there are now more options than ever to make the space feel warm and stylish. With so many different options available such as brown baby bedding there is no need to settle for pink or blue." If you are looking for a way to add real impact to your home, then you should try chandelier lighting. You can get every style imaginable, from classic to contemporary. You just need to find the style that looks the best in your home. Out of all the different types of improvements you can do to your home, adding solar lights is not only one of the easiest, but one of the least expensive as well. Solar lighting is also very environmentally responsible, as it reduces our dependence on fossil fuels. You can find out more about the benefits of solar powered lighting at the Solar Lights Site. Some chores around the house just get pushed to last on the list and cleaning lamp shades is one of them. It is that difficult, but it involves a lot of preparation, such as getting the right supplies and removing the lamp shades and then replacing them one done. A few tips can save you time and some money. 1. It may be best to just get all your lamp shades in one area. Many of your lamps can still provide light while you clean the shades. It won't take all that long to do the chore, so you should be able to replace them all fairly quickly anyway. Find a place to work, such as a kitchen table or unused room and lay down a drop cloth. Put all the shades of the same type together on the cloth. To be careful with the delicate fabrics, read the cleaning instructions carefully. 2. If the shade is made from hard material such as glass, hard plastic, or ceramic, use the right kind or cleaner for that. Always check which materials should not be mixed with others for safety reasons. It is important to use the correct amount of cleaner per the written instructions. Cleaning cloths should be stiff for harder materials and soft for the the fabric shades. Don't mix the cleaning cloths; use one for glass and one for fabric. 3. Use a soapy mixture for the fabric lampshades and soak the cleaning cloth first. Wipe each fabric shade carefully with a slightly soapy cloth and be delicate to prevent scratches and wrinkles. Take a second cleaning cloth dipped in clean water to remove the soap. Set them aside and let them dry thoroughly. 4. For the glass type shades use some glass cleaner on a separate cloth. You can use more pressure with these shades to remove all the dirt, dust, and oily residue. You will likely need to do this twice to get all the grime off. Using a separate clean cloth and water, rinse the shade then dry with a paper towel. 5. Let everything dry completely before replacing. If you get to impatient, you run the risk of getting water near the electricity and that is not safe. Get rid of all the used cleaners by flushing them down the toilet then hang the cloths in a place to dry. Now you will have clean shades for a few months. When your lampshades are clean, the whole room seems cleaner, especially at night when the lights are on. Don't forget to wipe off the lamps themselves of all the dust and fingerprints. Never wipe a lamp without unplugging the electricity. Safety First! You can even enjoy more of the light , now that it can get to you through your clean lamp shades.